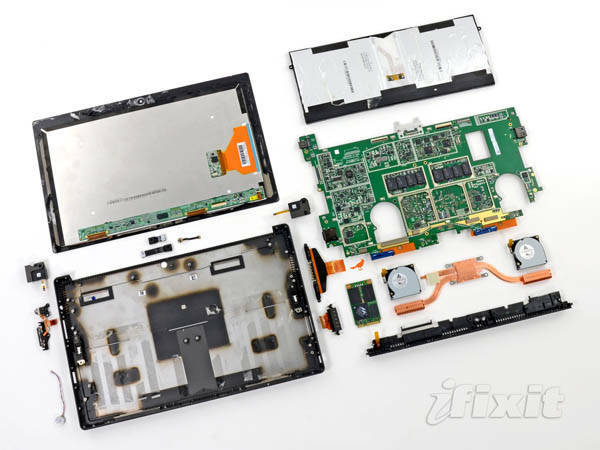 Photos Microsoft's new Intel-powered, Windows 8–running Surface Pro continues manufacturers' increasing drive to create kit that's all but impossible to repair, according to the part-and-repair folks at iFixit. "The Surface Pro received a 1 out of 10 score on our repairability scale — the worst any tablet has ever received," iFixit wrote in an email announcing their teardown of Microsoft's tablet-Ultrabook mashup. "The display assembly is anchored down with the most adhesive we've ever seen on a small device;" they wrote, "in fact, it took us well over an hour to figure out how to get inside — an iFixit first." 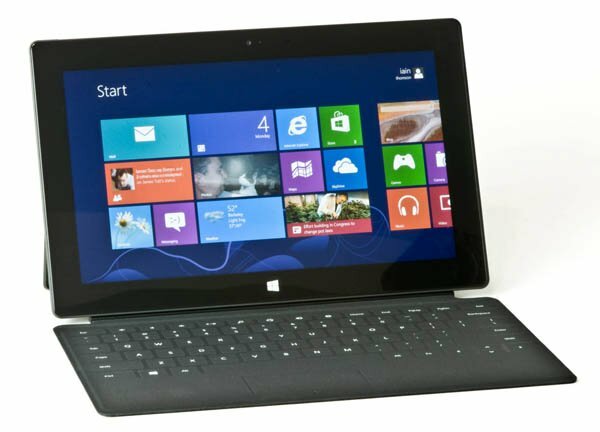 The Surface Pro's difficulty of internal access contrasts with that of Microsoft's Nvidia Tegra 3–powered Surface RT, which received an iFixit reparability score of four out of 10. Even Apple's iPhone 5 received a score of seven. You might think that the two Surface devices would be somewhat similar inside, but after melting the tar-like adhesive securing the Surface Pro's display, "it turns out that the Pro is a completely different bag of beans," iFixit wrote. 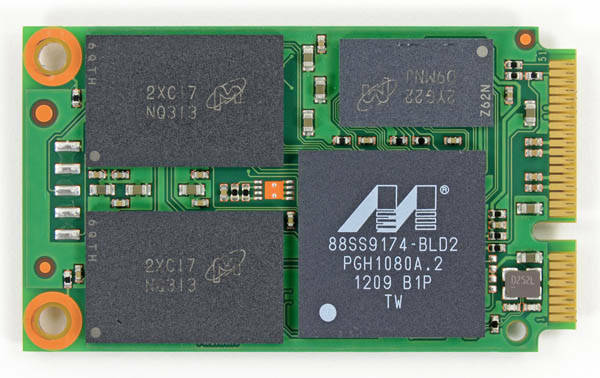 For one, the Surface RT has 32GB of Samsung KLMBG4GE4A NAND Flash soldered onto its logic board. 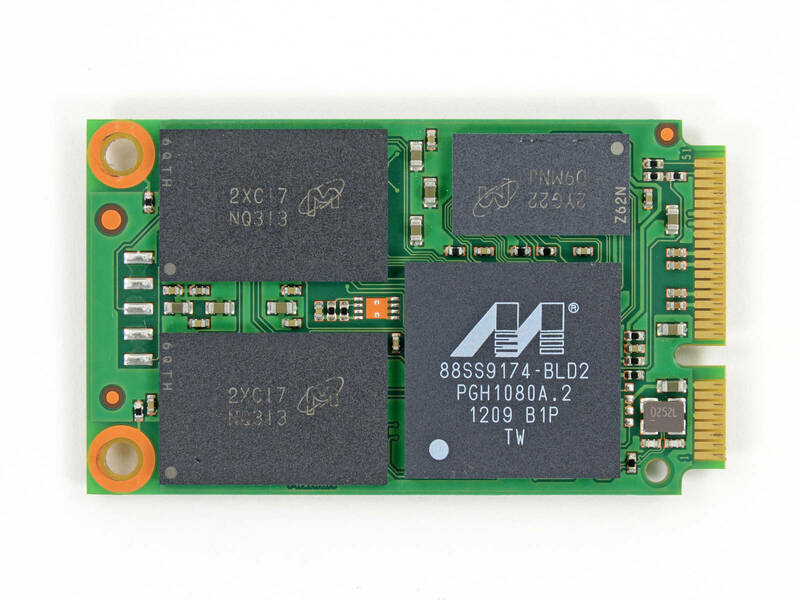 The Surface Pro that iFixit eviscerated, by contrast, has a independent 64GB SSD drive – a Micron RealSSD C400, to be specific – that would be easily upgradeable if the Surface Pro were easier to open. iFixit points out that those 64GB shrink to around 29GB "after negating 30+ GB for the operating system, the full MS Office suite that you may not have even activated, as well as the factory restore image." They also, however, point to a ZDnet story that compared a 128GB Surface Pro with an equally endowed MacBook Air, and discovered that the Air bested the Pro by a bit less than 10GB free storage space when the latter included the restore image, and by a mere 2GB when that image was removed. We'll call it a draw, essentially. And if you regard the Pro as a tablet rather than a laptop – your call – remember that it has a microSD card slot and the iPad does not, a fact that The Reg reminded you of last month. While we're comparing Microsoft and Apple devices, iFixit discovered the Surface Pro's two fans to be marvels of miniaturization when compared with the dual fans in Apple's 2011 and 2012 non-Retina MacBook Pro. But back to the Surface: needless to say, with the Surface Pro being a full-fledged, Windows 8–capable PC, its logic board has quite a bit more beef to it than does the Surface RT. The top of the logic board contains such niceties as 4GB of Micron DRAM (red), an Atmel touchscreen controller (blue) along with three supporting Atmel touchscreen controllers (pink) identical to the ones in the Surface RT. 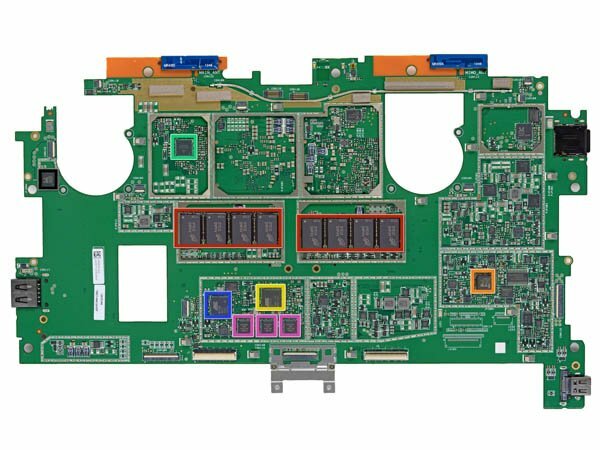 Should you care to explore the identities of the other chips in iFixit's photo, check out Step 14 of their teardown. 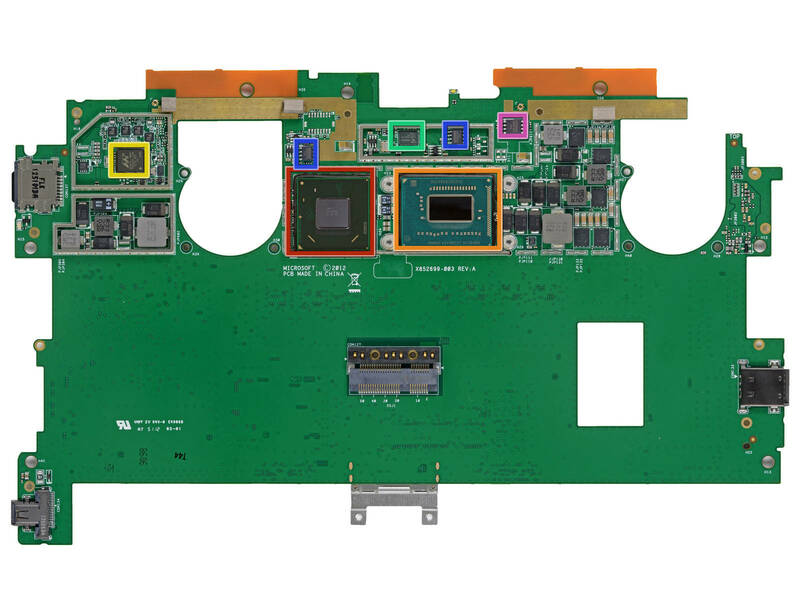 Ensconced on the underside of the Surface Pro's logic board is one of the most significant differences between the Pro and the RT. "What might that be?" you may ask. Well, clearly it's the Intel Core i5 processor, of course – a 1.7GHz, dual-core, 3rd Generation i5-3317U (red) that enables it to run full-blown Windows 8. More details on the i5's logic-board neighbors can be found in iFixit's Step 15. When The Reg reviewed the Surface Pro, we found it to be a quite capable little laptop, as long as you didn't need to actually use it on your lap. Unfortunately, however, iFixit's teardown has added a second caveat: it's quite capable as long as you don't need to upgrade or repair it. Of course, your average user couldn't give a fig about repairability – until their battery dies a couple of years down the road, perhaps – and whether the Surface Pro's lack of internal accessibility is important to you is a matter of your own personal taste. Your humble Reg reporter, however, prefers his computing devices to be easy to open and easy to repair and upgrade. Call us old-school, if you will, but the increasing propensity of manufacturers to create devices that unthinking users will toss into the garbage dump – that'd be a rubbish tip to our UK friends – gives us pause. There's enough toxic crap in our landfills as it is. Not that the Surface Pro is alone in its inaccessibility. Apple's fourth-generation iPad, for example, received an iFixit repairability score of two out of 10, and the iPad mini the same score of two. Inaccessibility is not limited to such compact devices. iFixit gave the 13-inch MacBook Pro with Retina Display a score of two, and its big brother 15-inch MacBook Pro with Retina Display did even worse score, equaling the Surface Pro's score of one. Moving from laptop to desktop, the 21.5-inch iMac received a score of three, while Apple's iMac mini, on the other hand, was awarded an impressive reparability score of eight out of 10.